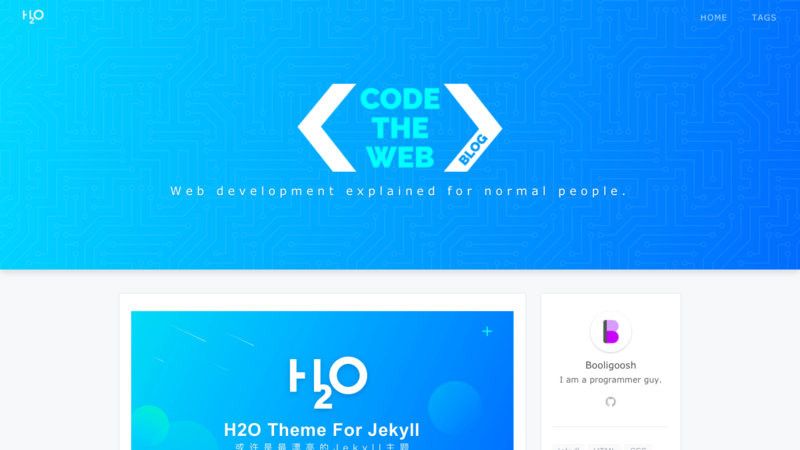 Today marks the two-month anniversary of the first post on Code The Web. Since then, a lot has happened - I will go into it in this article, and give some stats and analysis about how this blog is going and How I’m going to improve. NOTE: Okay, yes this post is about the blog and not about programming. You don’t have to read it if you don’t want, but its here if you’re interested. It’s a way for me to keep track of my progress and write it all down. So, if this article sounds like its gonna be boring, go find another article. On the 18th of September 2017, an email appeared in my inbox. Oh yeah! I had been chatting with this person on DevChat called @Nythiennzo. 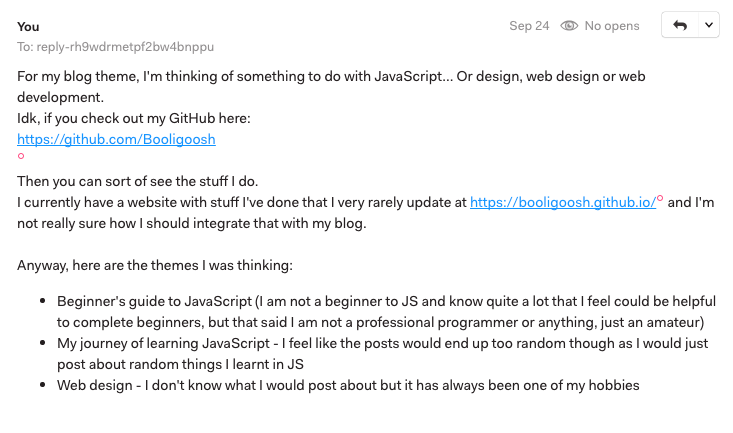 We had been talking about programming blogs - something that I had been thinking of for ages. Nythiennzo had just started his blog, and he recommended this course to me - How to Create a Blog That Boosts Your Software Development Career, by this awesome YouTuber called Simple Programmer. I had signed up for the course, thinking I would see what it was and look at the information later and then quite frankly forgot about it. However, when this email appeared in my inbox, I was reminded of it. And by the end of the email, I was hooked. The email course sends each Tuesday and Thursday. 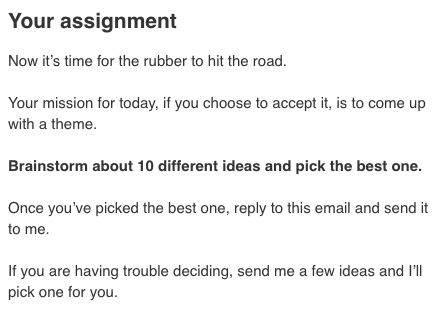 I was excited about the course, but I wasn’t actually planning on making a blog as the course came until I read the first actual course email. At the end of the first email, John (the guy who made the course) gave me some homework. Well, I mean I had to do it right? Unfortunately, John didn’t reply (which is understandable considering he has so many emails), so I decided to wait. That was all fine until the next email came along - telling me that this was when I needed to create my actual blog and buy a domain name. But I hadn’t chosen a theme yet, so couldn’t come up with a name, so couldn’t make the website. I had to make a decision, and I went with beginner web development as that’s where I think I can provide the most value. The next day I put up my first blog post, which was exactly two months ago from today! That’s it for how it all started, if you want to read more about the process then you can check out that first post, where I wrote about it. In this section, I’m going to give a few stats about how my blog has performed over the last two months, collected from my Google Analytics. Since starting my blog, I have had 4.1K users and 5.8K sessions. Considering that this is only in the first two months, I am pretty happy. The problem is, over half of those users all came in one day!! Initially, that might sound like a good thing, but that means that my users other than that one spike in traffic would be a lot less. 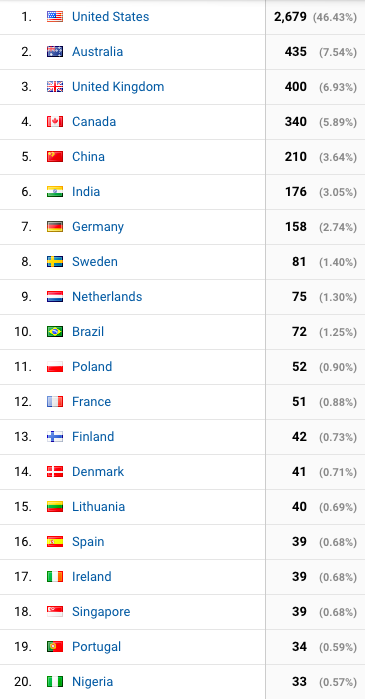 Here are the top 20 nationalities of users: A large portion of my page-views come from America, with Australia as the runner-up. I live in Australia so that probably biases the data, but other than that it is mostly accurate. 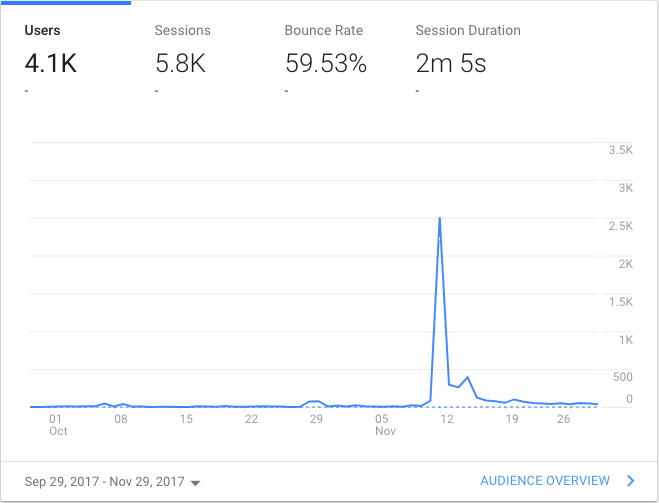 Here’s how I gain my users: Most of the traffic is direct. This is probably mostly a case of when Google Analytics is not able to determine where the user came from. The social part was almost all from Reddit (96%), I posted Code The Web on there a few weeks ago and got a lot of traffic (that’s where the 2.5K spike came from). 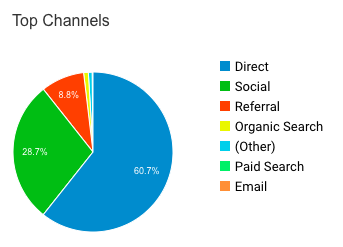 The referral traffic is from lots of different sources including places that embed Reddit content, and most of all this Chinese website that featured me in one of their articles. 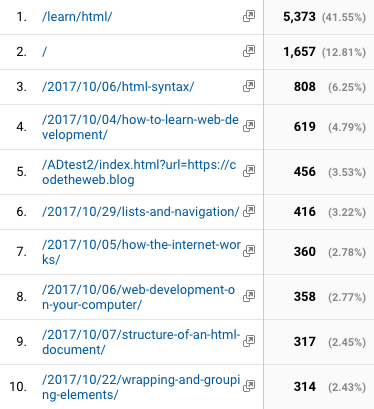 The /learn/html page was obviously the most popular, as that was the page that I linked to in my Reddit post. In terms of popular articles, my How To Learn Web Development article was the most popular. I think that is because it has a very generalized title, which I should keep in mind when writing future posts. I’m not really sure about the order of the other articles in the top 10, it seems kinda random (although you can tell me your hypotheses in the comments). Since my blog has started, I’ve got 50 subscribers on my mailing list - the majority of these people found me on Reddit. Consistency: I managed to post at least once a week for the two months (except for one week, which I caught up). I have written 17 posts in two months (~10 weeks), which means an average of about 1.7 posts per week! Motivation: During the two months, I barely ever felt de-motivated - and when I did, I was always able to push through. One of the most motivational parts of the process has been interacting with readers. Community: While I have only interacted with a very small percentage of my users, the ones I have interacted with have been grateful, liked my writing style and been really enthusiastic. It is really cool when I’m able to help someone through their coding journey. Writing style: While it’s natural to feel that my writing is not good enough, I have received multiple comments about my good writing style. I definitely didn’t expect this so early, as I was expecting I would have to improve a lot more first. I still think that my writing is far from perfect and this is something that I want to further improve. 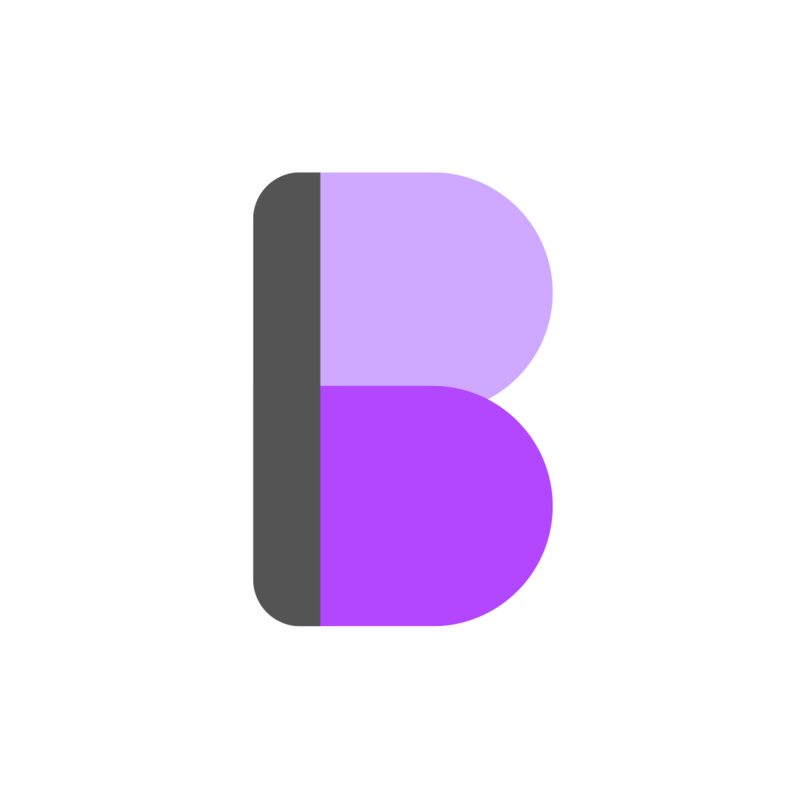 Programming Bloggers: A week or so ago, I started a Slack community called Programming Bloggers. I made it because of frustration at how hard it was to communicate with other tech bloggers, so I created it. The community is really friendly, they are happy that I have organized it and I’m happy because I have learned a lot from them. Typos and grammar: Even though some people seem to like my writing style, often while writing these I make typos. Because I write my tutorials in Markdown in a code editor and I haven’t worked out how to install spellcheck on it, I often don’t pick up on these typos and find them weeks later when I happen to be reading an article. Another thing that I have tried to improve my language and wording is an awesome website called Hemingway. It assesses a bunch of fancy things like adverbs, passive voice and how easy sentences are to read. I tried doing this on one of my articles, but it took over an hour to fully edit it using Hemingway. This means I could have written a whole new article in that time! A solution could be to write the post straight in Hemingway and edit as I go, but then I don’t know what I’d do about the Markdown - maybe I could just copy in the result after finishing each paragraph. Based on the success of Programming Bloggers, I’m considering creating a Code The Web fans community where readers can chat, help each other out etc. - I probably won’t do this right away but will keep it in mind. Find more things to post about on Reddit and around the internet, such as hosting mini-contests, making a tool or creating a checklist (similar to this?). If you liked this post I’d love it if you helped out and shared it with your friends, or joined 50 other awesome people and signed up to the newsletter. If you found this post boring, don’t worry - It’ll be back to normal next time! This is just me rambling on about my experience starting a blog, which you may or may not have found useful. See you next time, where I’ll be talking about Advanced background images!